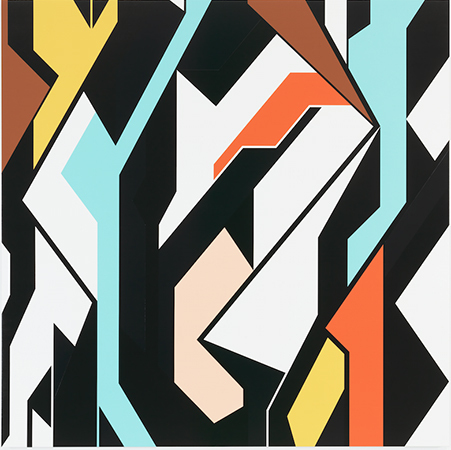 Sarah Morris, Power Station, 2016. Household Gloss on Canvas, 214 x 214 cm. Dirimart is delighted to announce Hellion Equilibrium, an exhibition by New York based American artist Sarah Morris. The artist will show new paintings, drawings and a major film work at Dirimart’s recently opened Dolapdere location. Morris’ paintings, known for their distinct use of color, streamline a way of perception as much as a virtual architecture, which is suggested through her titling and her use of space. The title of the exhibition take their cue from a ship sighted in Abu Dhabi, but originally registered in Panama. The latest paintings explore states of equilibrium when they are challenged, the condition of balancing opposing forces and influences, as well as the nature of those forces and influences. The exhibition also includes Morris’ film, Strange Magic (2014), commissioned by Fondation Louis Vuitton in Paris, and shown for the first time in Turkey. The film depicts France’s connection to the production of luxury in relation to France. Frank Gehry’s building becomes the starting point for a focus on the machinery behind France’s cultural currency namely fashion, fragrance and Champagne to examine national identity as well as the role of architecture in relation to power. Sarah Morris lives and works in New York. She has been exhibited internationally including solo exhibitions at the Museum of Modern Art, Oxford (1999); Kunsthalle Zürich, Zürich (2000); the Nationalgalerie in Hamburger Bahnhof, Berlin (2001); Kunstforeningen, Copenhagen (2004); Moderna Museet, Stockholm (2005); Palais de Tokyo, Paris (2005); Kestner Gesellschaft, Hannover (2005); and Museum Boijmans van Beuningen, Rotterdam (2006); Fondation Beyeler (2008); Lenbachaus, Munich (2008); MAMbo, Bologna (2009); and Museum für Moderne Kunst, Frankfurt (2009); K20 Kunstsammlung Nordrhein-Westfalen (2010); Wexner Center for the Arts (2012); Kunsthalle Bremen (2013); and M Museum Leuven (2015), and Kunsthalle Wien (2016). Work by the artist is held in the public collections of various museums including Centre Pompidou, Paris; Solomon R. Guggenheim Museum, New York; Museum of Modern Art, New York; Museum für Moderne Kunst, Frankfurt; Neue Nationalgalerie im Hamburger Bahnhof, Berlin; Stedelijk Museum, Amsterdam; Tate Modern, London; San Francisco Museum of Modern Art, San Francisco. Exhibition is kindly sponsored by Ferko.